Dental Insurance is a driving factor in many of our guest’s decisions about their teeth and smile. We understand how confusing dental insurance can be and want to help in any way possible. Incredible Smiles is dedicated to maximizing your dental insurance benefits and will continue to assist you throughout the entire process. This extra amount of money will go along way, whether you’re undergoing a basic procedure or a complex repair. An example could be: https://www.dentalimplantsusa.com/treatment/removable-partial-denture-to-replace-one-tooth/. Insurance is a must-have. While you are here for a visit, payment will be due in full at time of service. Upon completion of your visit, we will file your insurance claim. After 15 – 30 days the insurance company will mail any reimbursements directly to your home. To have a successful insurance experience, please keep in mind this takes commitment between each unique guest and our office. Remember to be pro-active and familiar with your dental plan. If you communicate with us in regards to any requests or problems, we will help you in a very prompt manner. Why did my insurance not cover something that Dr. Kemmet recommended? We have found that when the guest pays in full and then a claim is filed the guest receives the reimbursement much quicker due to our new insurance broker software. So we aim to resolve this usually within 15-30 days. Many times insurance companies do not have your best interest or health in mind. Dr. Kemmet has completed a clinical diagnosis and recommended treatment with your best interest and health in mind. Some plans, however, exclude or discourage necessary dental treatment such as sealants, adult orthodontics, and other dental needs. Guests need to be aware of the exclusions and limitations in their dental plan but should not let those factors determine their treatment decisions. Insurance companies make money by denying benefits. We have found the better insurance companies cover a wide range of services. Yes, we want to help maximize your insurance benefits. We can submit a pre-determination of benefits on any future service that is recommended. Please keep in mind that these take 15-30 days to receive a response. If you haven’t received a response within this time frame, please call your insurance company to see if they have received the pre-determination and if so what the status is. If they haven’t received it, please give our office a call; many times insurance claims are lost in the shuffle at the insurance office and need to be resubmitted. If it is important that you receive the estimate before your scheduled treatment, we may need to reschedule your visit to allow time. It is also important to remember that this is only an estimate of benefits, not a guarantee of payment. 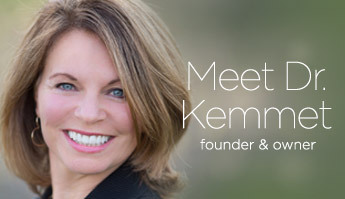 At this time Dr. Kemmet is considered an out-of-network provider to all insurance companies. It is always a good idea to call your insurance company to see if the insurance plan covers out-of-network providers. The maximum benefit is the total maximum dollar amount your dental insurance plan will pay toward the cost of dental care incurred by you in one calendar year. This amount varies per plan, however typically it is between $1000 – $1500. Most plans have a one time or lifetime orthodontic benefit. This means in the lifetime of your insurance plan coverage they will pay out a benefit only one time. Usually this benefit ranges from $1000 – $1500 and does include coverage for invisible braces. We would recommend calling your insurance company to see if your plan covers orthodontics. Additionally, we can submit a pre-determination of benefits for any future orthodontic treatment.